The maritime custom of painting eyes on the bows of boats of the Mekong Delta in Vietnam has been practiced for centuries. Their gaze is thought to ward off evil spirits and bring good luck. Large eyes indicate male boats and smaller female vessels. 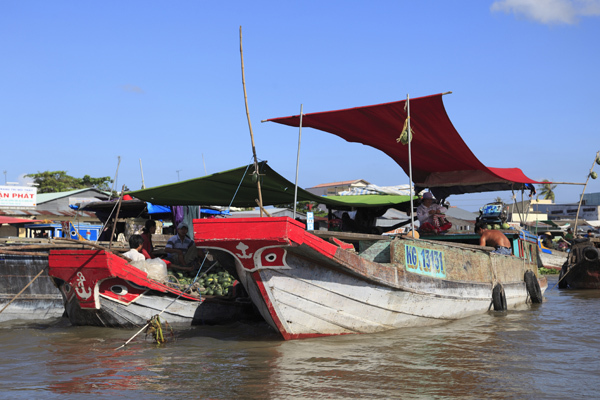 The male and female pair pictured here were moored near Can Tho, the largest city in the Vietnamese Mekong. an interesting tradition - haven't seen this before - great shot! I find maritime superstitions/customs interesting as well. Check out my awesome travel blog when you can!